Really a lovely card so well put together great job, thanks for sharing..
We've had wall to wall sunshine today! Still cold but a lovely day nonetheless! Love this card to bits Sylvie - gorgeous! Fab as always and perfect for the challenge, Sylvie! Cold but sunny and bright here today. Spring is on the way - hooray! Fabulous card, Sylvie! 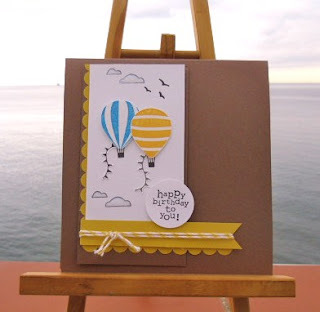 I really like the pops of bright colours on the balloons and against the kraft! A brilliant card, Sylvie! Fabulous use of space and love how you used the borders! Oh Sylvie, those air balloons are gorgeous! Love the card. So pretty! Gorgeous card Sylvie. Love the balloons and fab design. Love your less is more cards! They're so cute! I love your colour choices alongside your kraft card base. Hope your weather has picked up a bit. Ours has been lovely these last few days but this morning we have fog and frost! This is a sweetie Sylvie! Wow Sylvie, so many wonderful creations since my last visit...all absolutely stunning! Love the design and colors on this card. Fabulous! What a cheery design...love the shot of yellow... What a lovely cheery card to post on a bit of a dull weather day!